OnePlus has been trying to get its ducks in a row for the past few months, slowly fixing most of the issues people have had with its ordering and shipping process by no longer requiring invites to buy phones and providing free shipping on orders above $100. 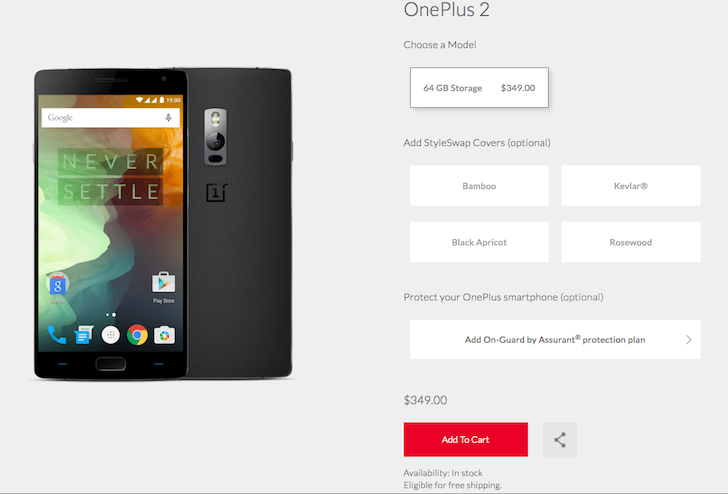 Now it's back with another enticing reason to buy its OnePlus 2: a $40 price drop. The phone, which launched in July, came in two different configurations: 16GB storage with 3GB RAM and 64GB storage with 4GB RAM. The former doesn't seem to be available anymore, and the latter which was priced at $389 at launch is now down to $349. That's definitely a good price to pay for a Snapdragon 810 phone with a 5.5" 1080p display, 13MP camera, 3300mAh battery, and a fingerprint sensor. It doesn't have NFC, wireless charging, or fast charging though, so keep that in mind if you need those features. Customers who bought the OnePlus 2 in the past 15 days will be emailed and refunded the $40 difference. That's thoughtful.